Google Drive is a free cloud storage service developed by Google. It enables users to store any kinds of files, such as photos, videos, documents and more across all of the user's devices. Google Drive lets you preview these files within the browser without having to download them. Google Drive is a great alternative to hard drive. And Google will give you 15GB of free cloud storage just for signing up. Can I Transfer Songs from Apple Music to Google Drive? You can upload audio files to Google Drive which only supports audio types including MP3, MPEG, WAV and OGG. Obviously, you can't transfer songs from Apple Music to Google Drive directly. That's because Apple Music files are in an encrypted format AAC with FairPlay DRM protection, which prevents you from moving and playing these music files on other programs like Google Drive. 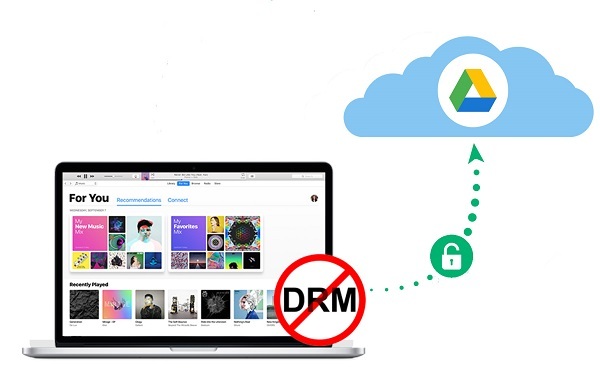 Therefore, if you want to put the songs downloaded from Apple Music to Google Drive, at first you need to remove DRM from Apple Music and then convert them to the Google Drive supported audio formats, like MP3. So the key point is to confirm whether it's possible to remove DRM from protected Apple Music songs. Fortunately, if you search on the internet, you will find there are so many DRM removal tools for Apple Music. 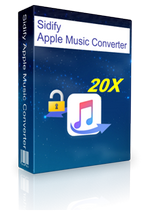 Among them, Sidify Apple Music Converter should be a top one you can choose. 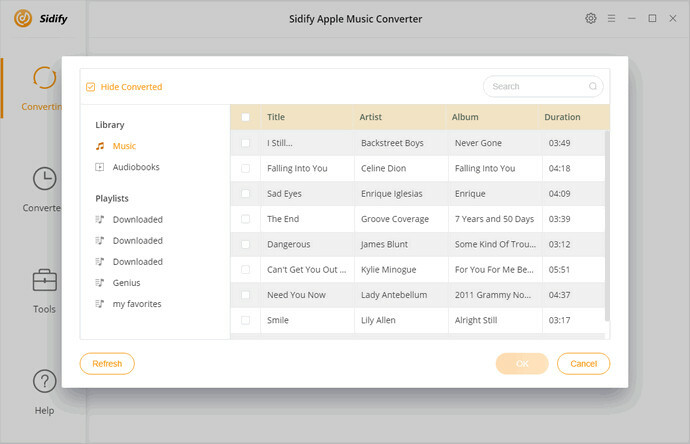 Sidify Apple Music Converter is a professional Apple Music Converter. 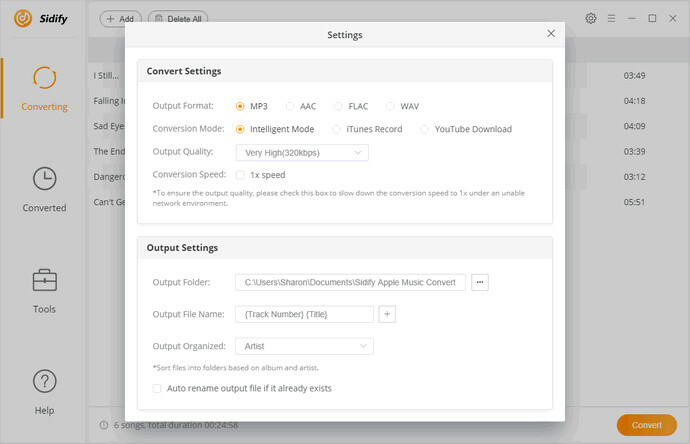 With it, you can completely remove DRM from Apple Music files and then convert them to unprotected audio formats such as MP3, AAC, WAV and FLAC. 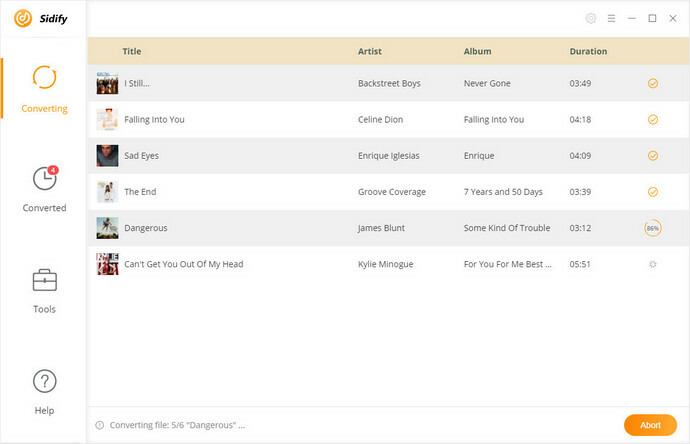 In this way, you can freely upload the converted Apple Music files to Google Drive. Upload Apple Music to Google Drive, Google Home, common web music player, etc. Fully compatible with latest iTunes & Windows 10 & macOS High Sierra. Now we will show you the complete user guide on how to get rid of DRM protection from Apple Music with Sidify Apple Music Converter. In this way, you can upload Apple Music to Google Drive easily as you want. 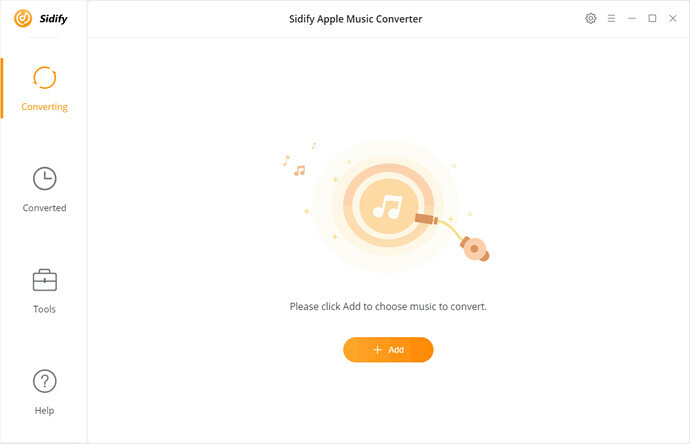 First of all, download and install the newest Sidify Apple Music Converter on your Mac or PC. Then double click the icon to launch the program. Then, please make sure you have downloaded the Apple Music songs on your computer. And then you can click + button to select tracks you want to convert from the pop-up iTunes library window. Then hit OK.
Next, you can click Setting /gear icon at the upper right of Sidify to select the output format. Currently it supports MP3, AAC, WAV and FLAC. Besides, you are also allowed to set the output quality and output path according to your own needs. Now click Convert button to start converting the DRM protected Apple Music songs to MP3. Once the conversion finished, you can find the DRM-free Apple Music files on the history option. Go to Google Drive and sign in with your Google account. Click on the New button and find File upload or Folder Upload. Located the converted Apple Music files and select files you would like to store in Google Drive. 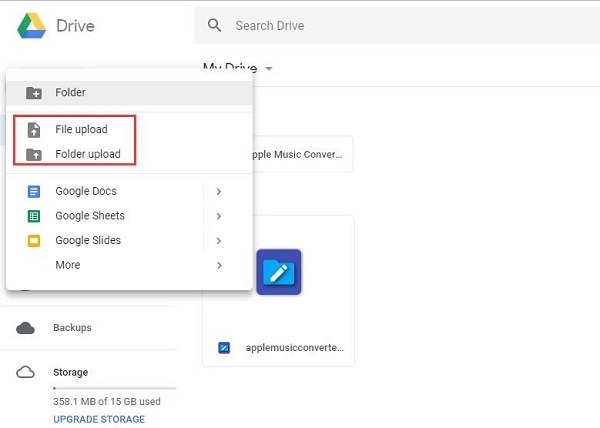 After few minutes, you can find the selected Apple Music files will be uploaded to your Google Drive successfully.